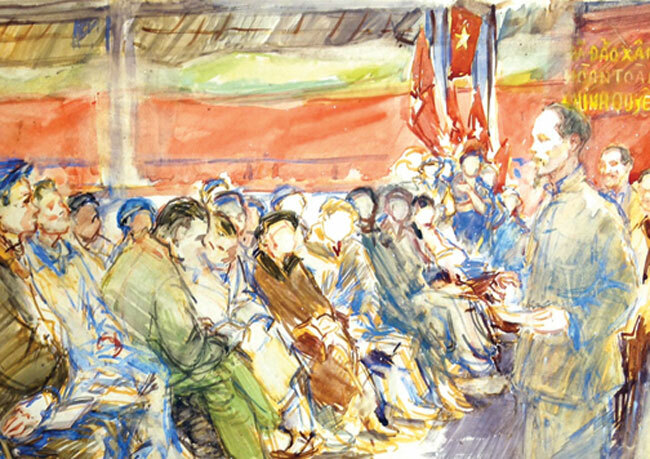 Sketchy: Painter Nguyen Cao Thuong finished this watercolour depicting Ho Chi Minh's 1945 address to the General Assembly of the People's Congress (1971) after 25 sketches. 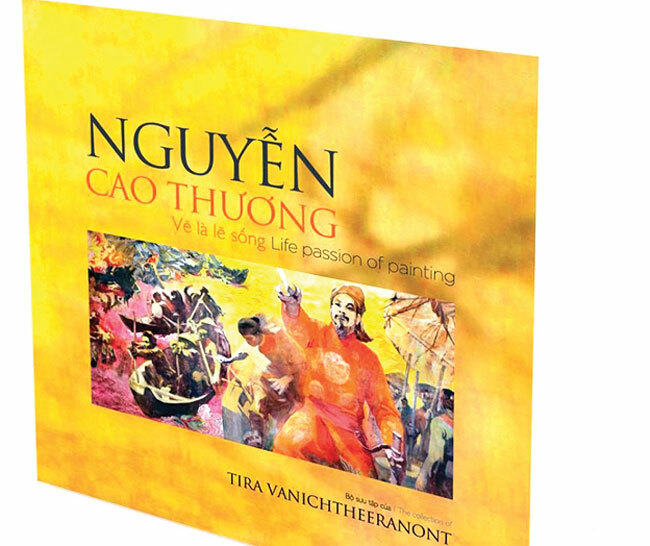 HA NOI (VNS) — A book featuring the entire collection of Nguyen Cao Thuong has hit bookshelves in an effort by a Thai collector, Tira Vanichtheeranon, to showcase important works by Vietnamese well-known artists. The book presenting 270 sketches and paintings was printed by Vietnam News Agency's Publishing House. Over the past years the Thai collector also published books on works of famous painters To Ngoc Van and Ton Duc Luong, as well as the book entitled Important and Invaluable Art Works of Viet Nam's Fine Arts. Late painter Thuong's art works are also on display at Vanichtheeranont's 333 Thai-Viet Gallery in Bangkok, Thailand. In 2012, Vanichtheeranont displayed rare works by Thuong, who had been granted a State Award on Literature and Art, and other Vietnamese veteran artists in an exhibition at the Viet Nam Fine Arts Museum in Ha Noi. Reading the news from the US, Ralph Matthews, an American art collector, noticed a painting of historical focus, signed Kao Thuong in the bottom right corner. Delighted, he immediately sent an email to Vanichtheeranont. Receiving a reply, Matthews learned that the painting was the oil-on-canvas Tran Hung Dao Danh Tran Bach Dang (General Tran Hung Dao Conducts the Bach Dang Battle). He then informed Vanichtheeranont that he possessed a collection of Thuong's drawings, which he had collected during trips to HCM City beginning in 2001. Inspiring: The cover of the Collection of Nguyen Cao Thuong book. Through emails and later meetings, they became friends and shared their mutual interest in collecting art works. The Thai collector was pleased to see 256 drawings by painter Thuong, which feature landscape and people in Viet Nam, Laos, Russia, Cuba, China, and Mongolia. It seemed Vanichtheeranont couldn't wait longer, so last year he asked Matthews to resell some paintings, as he was afraid he could not afford the entire collection. To his surprise, the American collector agreed to sell him the collection at a very reasonable price. Born in 1918 in the Cuu Long (Mekong) Delta province of Bac Lieu, Thuong enlisted in 1945, and became the first person to shoot down a French aircraft with a rifle in 1947. He was one of the students in the first course of the Fine Arts College Indochina in Ha Noi, and later he studied at the Suricov Art University, Moscow, Soviet Union. He was a member of the Viet Nam Fine Arts Association and headmaster of the Dong Nai Secondary School of Decorative Arts. His art works, mostly oil, had not been known far and wide, apart from those preserved at the HCM City's Fine Arts Museum and the Southern Women's Museum. Before he died at the age of 83, he had won many awards and prizes. Artist Le Thanh Tru visited Thuong in 1998, and his memories remains vivid. "It is easy to notice drawings of all sizes that stand by the walls and on the bed, as well as a suitcase, backpack, books, newspapers, paper rolls, canvas, materials, sketches, frames and so on," Tru recalled. "Thuong also displayed many paintings, including the oil-on-canvas Move Warbooty Cannon to the Base, featuring a glorious battle in Tam Vu [Long An Province] in 1947 in which our Vietnamese resistance forces seized the French army's 105mm artillery. The artist, himself, took part in the battle and took advantage of his time to sketch with pencils on typing paper. From this sketch, he developed a painting in 1996. Though he was 80, his strokes were still powerful, clear-cut, and filled with strong determination to fight with an optimistic spirit". Nguyen Hieu Trung, Thuong's son, recalled that his father used to paint for his own taste, thus, rarely paint as ordered. When drawing the Tran Hung Dao Danh Tran Bach Dang, which depicts the imposing national General in the historical battle defeating the Yuan-Mongol invaders on the Bach Dang River, his father asked him to stand in front, right hand held tightly so as he could exactly depict the General's body gestures when he unsheathed his sword, crying out for the soldiers to advance to destroy the enemy's boats. "He instructed me how to draw, but never forced me. He led a quiet life and drew less after he retired. He was born Nguyen Van Thuong, then used the pen names Nguyen Cao Thuong and Nguyen Kao Thuong to sign his paintings," Trung said. Trung, himself, does not keep any paintings from his father. When Thuong sold the house, he gifted the buyers many art works, though many were destroyed by termites and woodworm.